The low numbers of companies that offer benefits, such as health insurance, to employes ages 25-34 are just one reason why America's youth is "strapped," author and economic expert Tamara Draut said during her Financial Literacy Week lecture on Wednesday (Feb. 26) in the Lowman Student Center Ballroom. America’s 20- and 30-somethings can’t get ahead financially, and it’s not entirely their fault, according to Tamara Draut, author and director of the economic opportunity program at Demos, a public policy center in New York City. 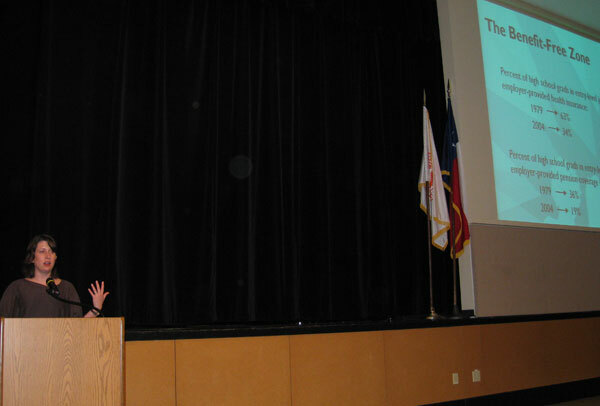 Draut, who has written extensively about the major economic issues facing Americans, addressed SHSU students, faculty and administrators on Wednesday (Feb. 26) as part of the Student Money Management Center’s Financial Literacy Week. The problem, Draut said, stems largely from the fact that the government, over the past 20 to 30 years, stopped investing in the types of things that help people get ahead. “For the first time in our nation’s modern history, the majority of Americans don’t think the next generation is going to be better off than they are,” Draut said. “Through the Great Depression, through many wars, Americans may have thought things were bad but they always believed in a better future. Among those ways are better jobs that paid better wages, even for those without a college degree; rising productivity in an economy that rewarded its workers for the job they did, “something we haven’t seen in a long time;” and public policies that made things such as low college tuition possible. “It wasn’t perfect; we’re always evolving and improving,” she said. Today, however, fresh-out-of-college graduates face jobs that “still look a lot like that bad (first, high school) job;” that don’t offer benefits like health care or retirement, “which is why today’s young people make up the highest group of the uninsured;” and decreased wages that don’t make up for the lack of benefits. Even before employers started massive layoffs or salary cuts because of today’s economic crisis, the median pay for young, male workers with a bachelor’s degree has decreased, from $49,384 in 1975 to $48,400. The median salary for a female employee has increased since 1975 but is still lower than males’, at $39,500. To get by under these circumstances, people ages 25-34 are turning to credit cards, with about two-thirds having credit card-related debt. While this debt is, in part, due to poor decision-making as a college student, the top cited reasons for credit card debt among all people were for car and home repairs and job loss. “Forty-five percent have reported that they’ve used credit cards in the last year to pay for basic things like groceries, rent payment, health care, gas in the car, because they didn’t have enough money in their checking account,” she said. College tuition at public universities rising by around 35 percent in the past eight years, combined with federal funding in the form of grants remaining the same as it was before the deregulating of tuition, has created what Draut calls a “debt for diploma” system. Draut doesn’t blame universities for the “debt for diploma” system but the government, which has shifted the burden of paying for college away from society at large to individual students and their parents. “Not only has this massive shift in the way we help students afford college hurt young people economically, it’s hurting our nation competitively,” she said. “If you look at the percentage of older Americans that have some college education, Americans who are 55-64, and you compare them to the rest of the advanced world, the United States ranks No. 1. We have the most educated old population. This burden also carries over when starting to raise a family, something that might not affect students now but will one day, Draut said. The numbers of working mothers in the labor force has risen from 31 percent and 34 percent for mothers with children under the age of 1 and 3, respectively, in 1976 to 55 percent and 57 percent for children of the same age in 2004. When it comes to navigating the many challenges of parenthood, you really are on your own in this country, Draut said. “This is one area where the United States again has really failed to address the enormous changes in the economy over the last three decades and an enormous cultural shift that has happened. With all of this in mind, hope is not lost, according to Draut. “We’re living through probably one of the, hopefully the, greatest challenges of my lifetime and your lifetime,” she said. “We had three decades of an era where we sort of just let the worst of ourselves rule the world: it was greed, it was individualism, it was profit at the expense of long-term thinking and sustainability, but I think that we have now turned a corner, and I think it’s your generation that is helping push us into a new way of thinking about the world and carrying ourselves through this world.